Noted journalist Malcolm Gladwell made this observation recently about the U.S. News and World Report college rating system. But the same could be said of the Ocean Health Index, which will debut early next year. It represents an enormously ambitious effort to quantify ocean health for every coastal country on the planet — reporting on everything from biodiversity to artisanal fishing to cultural uses to carbon storage and sequestration. We assert that when it comes to the ocean such audacity is necessary. Our planet now houses more than 7 billion people. In the face of unrelenting population growth, the oceans face unprecedented challenges — declining biodiversity, disastrous oil spills, changing coastal demographics, and more. Turning the tide will require connecting human development with the ocean’s capacity to sustain that progress in a comprehensive and transparent manner. This means thinking big. The Ocean Health Index is designed to take the pulse of the ocean using a framework that captures the costs and benefits to people and to the marine environment of which they are a part. As we’ve discussed in previous columns, the Ocean Health Index presents the full portfolio of benefits derived from the ocean in a single measure. 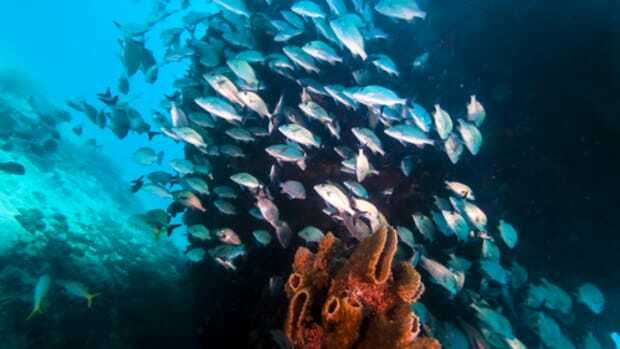 Just as you make investment decisions based on the collective performance of a portfolio of stocks, bonds, and mutual funds, this index will allow policymakers and managers to make choices about how to manage stressors such as marine pollution and coastal development in the context of how those choices affect fisheries and biodiversity. It represents a unique and transparent attempt to piece together a full impression of the ocean’s status. And no one else has been able to do it before. In crowded offices, during early morning commutes, around conference room tables, and through wakeful nights, the team of scientists developing the Ocean Health Index has wrestled with how best to represent what people value in the ocean. From Seattle, Washington to Santa Barbara, California, to Vancouver, British Columbia, and across the globe, they have worked round the clock to shore up every detail. Water quality was not the only ocean benefit that generated debates like the one described above. We had to get creative to measure the sustainability of seafood captured in fisheries and cultured on farms using data from catch and mariculture production, because there is no global information on the condition of the fish stocks themselves. The issue of marine livelihoods and economies required out-of-the-box thinking, too. We had to consider not just the number of jobs in marine sectors, but also their quality and the total amount of revenue they generated, and roll that information up into a single score. Creating workable solutions to these challenges and others was anything but trivial. The Ocean Health Index team was motivated by the urgency and extent of the problems facing the oceans. With the new United States National Ocean Policy, European Union Maritime Strategy, and other progressive policies like them around the world, we are inspired by new opportunities to do something about those problems through comprehensive marine management. The last century was replete with revolutions of many stripes — green, energy, and technological. Today, scientists, managers, and policymakers worldwide are calling for a way to revolutionize the way we approach our relationship with the planet. We believe the Ocean Health Index can answer this call by providing a robust, widely applicable framework that evaluates current conditions while accounting for sustainability. It can be scaled down to bolster local and regional management efforts. It is flexible, and can handle the good, the bad, and the ugly when it comes to data quality. It is quantitative and understandable, giving the world a measure that can be used to gain perspective on the full portfolio of benefits we receive from the ocean. The Ocean Health Index is a new way of thinking about ocean health and marine management. We have enough information to measure it now. It’s deciding what to do in light of this information that is going to require some real nerve.